← Custom Cheap Promotional Items – KOOZIES! In the simplest definition, marketing is about being found, or remembered, so your product/service can be sold/purchased. The marketing quagmire, for you and me, is how to market to generate more money! We want the most possible income with the least amount of marketing. There is essentially one core element to marketing. That’s it, just one. Fit your marketing into this one request and consumers will come. WANT. People buy what they WANT to buy! Have you ever bought something you didn’t need, but really wanted? Ever bought a candy bar you didn’t really NEED, but something inside just made you buy it? Have you ever looked for something with a passion on the Internet and bought it? Have you ever spent hour’s price shopping because of something you WANTED in in order to save a little money? Some people purchase NEW released items, because they WANT to have the newest/freshest available! Some people purchase items on sale, because they WANT to save money! Some people purchase vintage items, because they WANT the memories associated with the era of the item. Some people buy insurance, because they WANT to feel secure! Some people buy information, because they WANT to gain a better understanding. Some people purchase investments, because they WANT more for their money. Some people purchase and pay full retail, because they WANT what they WANT! And some people buy because they WANY what they WANT! A perfect example is a pocket knife auction I witnessed on ebay. This particular knife was no longer in production and others like it can usually fetch around $10 to $20, however this knife sold for over $150.00. I was floored and thought; Wow the winner really WANTED that knife! eBay is a perfect example of people buying what they WANT, because almost anything a person could WANT, can be found! Now that we’ve established why people buy, how do you and I connect with our marketing? Where should we market? How much should we market? These are the great mysteries of marketing! The most obvious answer is: be where your customers will be so they can find your product/service. Unfortunately, in today’s world, your customers could be any number of places, from; the Internet, to events, to print publications, to seminars, to tradeshows, to opening their mail, etc. No doubt, there are a plethora of options as to where your customers could be and more times than not, they are in a number of different locations. And instead of making your marketing a clearer choice, it only muddies up your decision for the best opportunity to reach out and market! Frankly, to be quite honest, I had no idea how this article would end when I began writing. Deep inside, secretly, I was hoping the answer would appear. I was mentally rifling through all I knew on the subject of marketing as it has been a core part of my selling career for the past 20+ years! I kept thinking, there must be one clear concise way to market and I must know the answer. I must! Marketing can’t be that big of a mystery to me as I’ve been so involved with it. UGH! I actually was ready to trash this entire article because I couldn’t provide you with the answer. Then, out of the back of my pea brain, a thought trickled in about a marketing program I owned, but hadn’t utilized in ages. But, one second, I did utilize this marketing program not long ago. I started a Facebook page for my knife blog (www.pocketknivesblog.com ) and offered a free knife if I could get to 50 “likes.” You see, how this works? I “WANTED” more people to expose my blog to, so I offered a prize. There’s that word “WANT” again. And the real, true, deep-down WANT was to get more visitors to my blog so I could increase the chances of them clicking on my ads, so I could fill my WANT of making more money! Quite simple isn’t it? DUH! Sheesh, sometimes I think I have two brain cells, and one is waving bye-bye to the other. So, in a round-about, out-of-left-center way, the marketing answer on marketing didn’t actually come from my efforts, rather the brilliance of Joe Garcia. 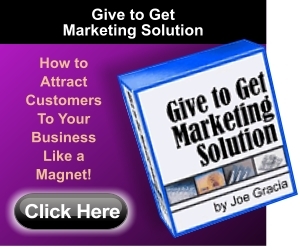 Years ago, I bought Joe’s product: The Give-To-Get Marketing Solution. I still have it (see pic below). By far, this is hands-down, bar-none, the Mac Daddy, champion of marketing. It’s actually soooooooooo simple and makes so much dad-gum common sense, you’ll wonder what the whole mystery of marketing is all about, because it becomes decidedly crystal clear after you read Joe’s book. I am very proud to be an affiliate, and I’ve got nothing but the highest praise and recommendation for this straight-forward, marketing how-to product. Sorry, I couldn’t provide the answer on Marketing, but at least I can point you in the direction of where it can be obtained! I 110% double decker promise you won’t be disappointed. Buy it now! You won’t regret it! And it’s less than 50 bucks! !